A man and woman died in a fiery collision between a box truck and a motorcycle in New Jersey early Friday, officials say. Tracie Strahan reports. A man and woman died in a fiery collision between a box truck and a motorcycle in New Jersey early Friday, officials say. 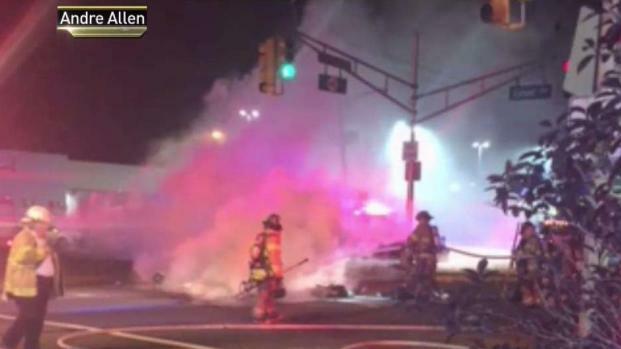 The horrific crash that happened around 2:30 a.m. in Jersey City on Route 440 sounded like an "explosion" before flames suddenly erupted in the area of Culver Avenue, a witness told NBC 4 New York. The witness, a security guard from a nearby car lot, said he heard the motorcycle go by him, but that it wasn’t traveling at a high rate of speed. He said he remembers a man and a woman riding on the bike, with at least one of them wearing a helmet. Police have not confirmed the witness' report. He said he didn’t hear any brakes screeching or anything to indicate a sudden stop. Two people are dead following a horrific morning crash in Jersey City, officials say. Tracie Strahan reports. The identities of the two people killed have not been made public. The dead woman was 27 years old. The stretch of route 440 was closed for several hours following the crash, but the northbound lanes had reopened around 5 a.m. The southbound lanes reopened at 6:30 a.m. The Hudson County Prosecutor's Office is in charge of the investigation.